Chances are likely you know Jerry Marotta’s music even if the name doesn’t immediately ring a bell. The esteemed drummer, multi-instrumentalist, and producer has performed on a multitude of popular recordings, for artists such as Peter Gabriel, Indigo Girls, Stevie Nicks, Paul McCartney, Tears For Fears, Hall & Oates, Rory Block, and Orleans to name but a few. 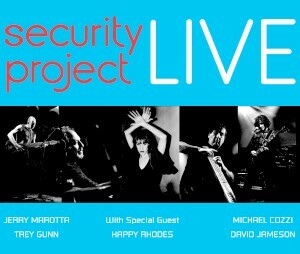 Currently Marotta is performing with the group Security Project, which he recently formed with King Crimson and Robert Fripp alumnus Trey Gunn. Security Project has released two live albums in 2016, including the brand new ‘Live 2’, to be officially released by 7d Media on October 21. The music on these two live releases are recreations and re-imagining of the material Marotta performed with Peter Gabriel in the late 1970s and early 80s. Rounding out the line-up is guitarist Michael Cozzi (Shriekback, Sky Cries Mary), keyboardist David Jameson (Beyond The Wall, Time Machine), and newest addition Happy Rhodes, who boasts a 4-octave vocal range. The addition of Rhodes to the Security Project means the ensemble will be expanding their presentation beyond just the Gabriel material on their October-November USA tour. JERRY MAROTTA: Of course. Where else in Milwaukee would one play, but Shank Hall? MI: That’s true! (laughter) And in Chicago you’re playing at Reggie’s Rock Club on October 22nd. I noticed that with each date, Security Project is there a day or two following right after Brand X, which is another band I’m a big fan of. And of course, Phil Collins was the original Brand X drummer, and I discovered on the new Security Project ‘Live 2’ you’re dipping back in to the Peter Gabriel/Genesis material, from ‘The Lamb Lies Down On Broadway’. So, you’re not playing the drum parts that you originally performed, like on the solo Peter Gabriel albums. How is that different for you, as the drummer? And where do you place Phil Collins in the hierarchy of rock drummers? JM: I’d put him pretty high up there. A great, great, drummer, and incredible artist, musician, writer, singer, and person. So, we do “Back In NYC” and “The Lamb Lies Down On Broadway” occasionally. I started doing “Back In NYC” back with the Tony Levin Band. You know, I’m not studying what somebody else played, on anything, including myself by the way. Like, when I’m looking at playing the Gabriel material that I played on, I don’t try to copy what I did. I just instinctively play. It’s always best if I’m just myself. MI: It sounds like it’s fair to say that the Security Project doesn’t intend to be an exact replica of that material, and you’re bringing your own life energy and personality in to those songs. JM: Absolutely. When we can. Some of the songs are so devastating, like “The Family And The Fishing Net”, “Lay Your Hands On Me”, “San Jacinto”… it would be really hard to imagine reinventing some of the songs. And, on this particular tour, we have a woman [Happy Rhodes] who is the lead singer, so [we’re] not going to try to replicate exactly what Peter or Genesis sounded like. It’s going to be interesting. Our last two singers, Josh Gleason and Brian Cummins, tried to sound more like Peter. And that’s nice, but our purpose here is not to be like karaoke. I’ve always been saying that having a female singer was something we could do in the future. I didn’t think it would happen so quickly, but it has, and I’m real excited about Happy Rhodes, who I’ve known for many years. She has 11 CDs out, and I played on some of her stuff, as has Trey Gunn. We’ll see where that takes us. Of course, we want to honor Peter, and, you know, I was there. Tony Levin, Larry Fast, David Rhodes, the basic ensemble that did ‘Security’ the record, it was an incredible collaborative effort. So [our music] is really in honor of everyone involved, but we also want to have our own identity. MI: Has Peter Gabriel made any sort of statement about this project, and given his blessing? JM: Not to me, no. I haven’t spoken to him about it. I would think he’d be excited and flattered. I mean, how could he not like it? In some cases, we’re taking material that he really can’t play anymore. The set that we’re doing… if he did that, he wouldn’t be playing in an arena, that’s for sure. Maybe a small theater, but you know, how many people are going to want to hear “White Shadow”, or “I Don’t Remember”, or “Normal Life”? That’s not what made him a big star. [The] ‘So’ [album] and “Big Time”, “Sledgehammer”, and “Don’t Give Up’, those 3 or 4 songs made him a huge, huge, star. But “Humdrum” and “Moribund The Burgermeister”, we’re able to do that stuff, [but] I’m not sure Peter really is. And to be honest with you, I’d like to see our audience be people who don’t even know who Peter Gabriel is, and just stumble across the band and the music and get blown away by it. Just like the way people got blown away when Peter’s record ‘Security’ came out. MI: Looking at your resume of recorded work, to say it’s impressive is an understatement. Do you consider those Peter Gabriel records to be among the most important work you’ve done? JM: Absolutely. Not just that [though], it was Peter. I learned something from Peter that actually, in a funny way, has hurt me. Because he’s such a brilliant thinker, brilliant organizer, and Peter was able to create an atmosphere. He didn’t know exactly what he wanted but he knew what he didn’t want. So, I got used to going deep in to the music and working stuff out, and then like, 9 or 10 of the albums I worked on, they’re not interested in that. They won’t want to go down that far. They just want to make a record. But Peter’s stuff is phenomenal. The Hall & Oates stuff as well. I’ve done a couple records with Sarah McLachlan [that were] fantastic. Los Lobos… Robbie Robertson, Elvis Costello, Suzanne Vega, they’re all equally up there. But Peter’s stuff, that situation was about as close to a “band” as you can get, because for the most part it was the same people for 10 years, except the guitar player. Generally speaking it was Larry Fast, myself, and Tony and Peter. So we did develop that band thing that I love so much. I love that atmosphere, and that’s one of the things I love about the Security Project. We’re kind of developing that, and this is really just scratching the surface. We’ve started out with this Gabriel material, but we’ll see where it takes us. There’s definitely going to be original material in our future. I’m excited about this band. Any time I’ve gotten the opportunity to play music with Trey Gunn has always been a remarkable experience. A lot of it was done with Robert Fripp, and then we hadn’t gotten much of a chance to play together until we started doing this project. MI: Yes, I am familiar with the material you did on the David Sylvian/Robert Fripp collaborations. I’m a big fan of that music. MI: Are you currently composing with Trey Gunn? JM: We haven’t sat down together. Trey has a number of records out, and I’ve been listening through to his stuff. I found 4 or 5 pieces that I want to start to work on. Trey and Michael Cozzi, our guitar player, live in Seattle. I live in Woodstock, New York. David Jameson, the keyboard player, lives in Westchester about an hour and a half from me. And now Happy is about two and a half hours from me. I think to some degree, the next thing we’re going to start doing is getting together either in Seattle where Michael has a studio, and start the process of writing, and then the same thing here. I have a studio called Dreamland, where we have generally rehearsed and done some recording. Hopefully this year we’ll get the ball rolling on that. MI: Something that was very integral to the emergence of Peter Gabriel’s reputation was the performance aspect of his concerts, with the theatrical lighting, costumes, and dramatic physical poses and gestures. Do you see Security Project moving in that direction? JM: To some degree, absolutely, but, having someone dress up like Slipperman or Watcher Of The Skies, no, I don’t think we’d go that far. But we’re using a lot of projection, and developing that. Projected images, behind us on stage. MI: What message would you like to say to the audiences who will be coming to your Upper Midwest concerts, or especially to those who are considering it but still on the fence? JM: We’re just performing this really phenomenal, unusual, interesting music, and it’s as valid today as it ever was. It’s just timeless. Like, “Lay Your Hands On Me”, what is that? It’s not really a rock song. When you listen to those records, it’s not rock music. It’s something else. And it’s so incredible to perform that. I just want to expose people to that [music]. That’s really the goal.